People of the Dongxiang ethnic minority live in the part of the Linxia Hui Autonomous Prefecture situated south of the Yellow River and southwest of Lanzhou, capital city of the northwest province of Gansu. Half of them dwell in the Dongxiang Autonomous County, and the rest are scattered in Hezheng and Linxia counties, the city of Lanzhou, the Xinjiang Uygur Autonomous Region and some other places. The Dongxiang ethnic minority received its name from the place it lives -- Dongxiang. However, this ethnic group was not recognized as a minority prior to the founding of the People's Republic in 1949. The Dongxiangs were then called "Dongxiang Huis" or "Mongolian Huis." The Dongxiang language is basically similar to Mongolian, both belonging to the Mongolian branch of the Altaic language family. It contains quite a number of words borrowed from the Han Chinese language. Most of the Dongxiang people also speak Chinese, which is accepted as their common written language. Quite a few of them can use Arabic alphabet to spell out and write Dongxiang or Chinese words. The Dongxiangs are an agricultural people who grow potatoes, wheat, maize and broad beans as well as hemp, rapeseed and other industrial crops. Historians are divided in their views about the origin of the Dongxiang ethnic minority. Some hold that they are descendants of Mongolian troops posted in the Hezhou area by Genghis Khan (1162-1227) during his march to the west. Other historians say they are a mixture of many races -- Hui, Mongolian, Han and Tibetan groups. However, according to legends and historical data, the Dongxiangs probably originated from the Mongolians. As far back as the 13th century, Mongolian garrison units were stationed in the Dongxiang area. In these units were Mongols and military scouts and artisans Genghis Khan brought from West Asia. In time of war, the military scouts would fight as soldiers on the battlefield. And they farmed and raised cattle and sheep in time of peace. These garrison troops later took local women as wives, and their offspring at the beginning were called "military households" which became "civilian households" with the passage of time. During the early years of the Ming Dynasty (1368-1644), they were offered amnesty by the Ming rulers, and they settled down permanently in the Dongxiang area. The Dongxiang people had been groaning under national and class oppression throughout the ages. This had driven them to take up arms against their oppressors many times. For several decades before the founding of the People's Republic in 1949, the Dongxiang people were suffering under the oppressive rule of the feudal Hui warlords, Ma Anliang, Ma Qi and Ma Bufang, and Kuomintang warlord Liu Yufen. What infuriated the Dongxiangs most was the pressganging of their young men into the armed forces by the Kuomintang and Hui warlords. At one swoop in 1948, the pressgangs rounded up a total of more than 3,000 young men. Even the ahungs in some mosques were not spared. They were thrown into the army after their beards were shaved. Pressganging operations that were carried out time and again had made the Dongxiang villages and towns devoid of young men. 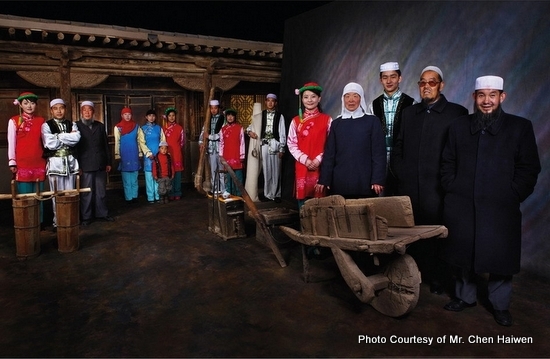 The Dongxiangs are Moslems, and at one time there were 595 mosques and 79 other places of worship in the Dongxiang area. This gave every 30 Dongxiang households a place of worship. Apart from the 12 imams, there were more than 2,000 full-time religious workers. That means every 18 households had to provide for one religious worker. And there were 34 different kinds of religious expenses which had to be borne by the ordinary people. The Moslems in the Dongxiang area were then divided into three sects -- the Old, the New and the Emerging sects. Carrying out a "divide and rule" policy, the ruling class sowed dissension among these sects. As a result, the Moslems were at feud among themselves. At times there were armed clashes. Since the early days of 1950s, the Chinese government has pursued a policy of freedom of religious beliefs in the Dongxiang area and taken measures to restore unity among the Moslem population. In 1958, the Dongxiang people carried out the struggle against religious and feudal privileges and the system of oppression and exploitation. This resulted in a further liberation of the productive forces. There are in the Dongxiang area many folk songs which the local people have dubbed "flowers" and were sung in the past by people to express their hopes for a better life and to pour out their wrath against oppression. The "flowers," which had been ruthlessly trampled down in the old days, began to blossom anew following the emancipation of the Dongxiang people. There are quite a number of popular narrative poems and folktales in the Dongxiang area. The long poem "Meilagahei and Miss Machenglong" sings the praise of the heroism of a young couple who pitted themselves against out-moded ethics and the feudal marriage system. The folklore "Green Widow Kills the Boa" depicts the courage, wisdom and self-sacrificing spirit of Dongxiang women. Many changes took place in the Dongxiang area after the arrival of the People's Liberation Army in the autumn of 1949. On September 25, 1950, the Dongxiang Autonomous County was founded to be followed by the establishment of many ethnic minority townships in other localities. "Solidarity Committees" were set up everywhere to eliminate disunity then still existing between the Dongxiangs and other ethnic groups. Many Dongxiangs were trained to be government functionaries at various levels. Trees and grass were and are being planted on barren hills to check erosion which had plagued the Dongxiang area for ages. Large tracts of farmland on hill slopes have been transformed into terraced plots. All this, coupled with the construction of irrigation facilities, has greatly raised annual grain production. A power station and factories turning out farm implements, cement, flour, bricks and tiles have made their appearance in the area, one of the most under-developed localities in China a few decades ago. Transport and travelling have been made easier with the arrival of trucks and buses, and with the construction of a highway network that links together all the townships, and the Dongxiang area with the provincial capital of Lanzhou.